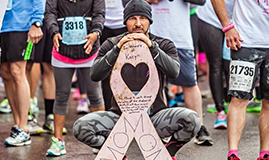 Thank you for making a donation on behalf of 2018 Komen Evansville Tri-State Race for the Cure. Your support gets us even closer to our bold goal: Within the next decade, reduce current number of breast cancer deaths by 50% in the U.S.
Plus what you give stays right here in your local community to help support treatment, screening and education and also supports national breast cancer research that's critical to saving lives. Thank you for making a donation on behalf of .